A former Green Beret, leader of the "Growling Recondos" in Vietnam, a CIA Agent for a decade, and a venerable "Agent of PRIMUS", John Wrath was the Silver Avenger of Millennium City. One of the original recipients of the Cyberline treatments, John Wrath's aging was arrested by the process and even though he's pushing 80, he looks like an extremely fit man in his late 40's or early 50's. The irascible old warhorse was forced into retirement after butting heads with the Director of PRIMUS and the PRIMUS Station Chief of MC while in pursuit of the same supervillain thieves that brought many of the heroes now on the Millennial Men roster together. After "retirement", John Wrath updated his superhuman registration card and became John Wrath, Solo Avenger! "I swear, my R&D shop is trying to kill me!" 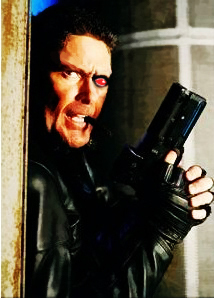 Wrath is a capable Martial Artist/Skill-monger with some gadgets (a gun and a cyber-eye that gives him Find Weakness) and a boat-load of skills. Basically a Nick Fury send-up. Wrath is essentially a "Super Agent" type of character, and does best in circumstances requiring finesse solutions, but has a broad repository of specialized skills, Martial Arts, and a variable setting gun to call upon in a pinch. In play Wrath tends to be extremely erratic, due to a combination of mechanics and the fact that his player is an intrinsically erratic (but frequently hilarious) person. When Wrath is "on", he is like a force of nature; when he's a bit "off" he's a walking comedy of errors. Regardless of his across-the-board performance, Wrath has ascended into cult-classic personality status, and is one of the most beloved staples of the Millennial Men campaign.